The Journey is the movement into the unknown. Heroes and monks adventure Beyond the Ninth Wave, into the uncharted realms. The Soul Journey and the cycle of life and death lie at the heart of Celtic philosophy. The maze pattern, or key knot designs represents our path through birth, life and beyond. These patterns are amongst our earliest sacred designs, appearing from as early as 25,000 BC. The Ancient Celts believed that the soul journies to the Otherworld, and buried their dead with ritual objects and food. This image is modeled on a small gold votive boat from the deposit at Broighter (Ireland) 1st century B.C. Saint Brendon the Navigator, also known as Brendan the Bold and Brendan the Voyager, was the greatest traveler of the Irish Saints. He was both a monk and man of the sea who made many journeys, establishing monasteries wherever he landed, such as on Arran and other remote islands in the Hebrides off the west coast of Scotland. Brendon set out on his mythic quest upon the sea with a company of intrepid monks to find the Land of Promise, Hy-Brasil. 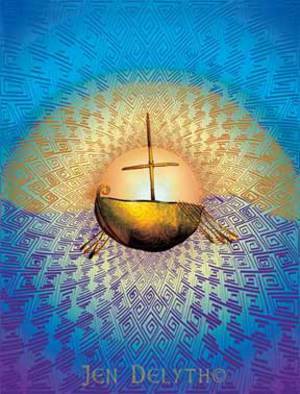 Sailing a simple curragh boat—a coracle of wood and leather—they set out into the unknown upon the great ocean, putting their faith in God, the elements and their great instinct for navigation by the stars (the Celts navigated by the movements of the Pleiades). This epic journey would take seven years. Finally, they arrived at the beautiful land they called the Promised Land of the Saints, having had many adventures along the way. We hear details of their journey in a popular book written by a monk in the ninth century, The Navigatio.